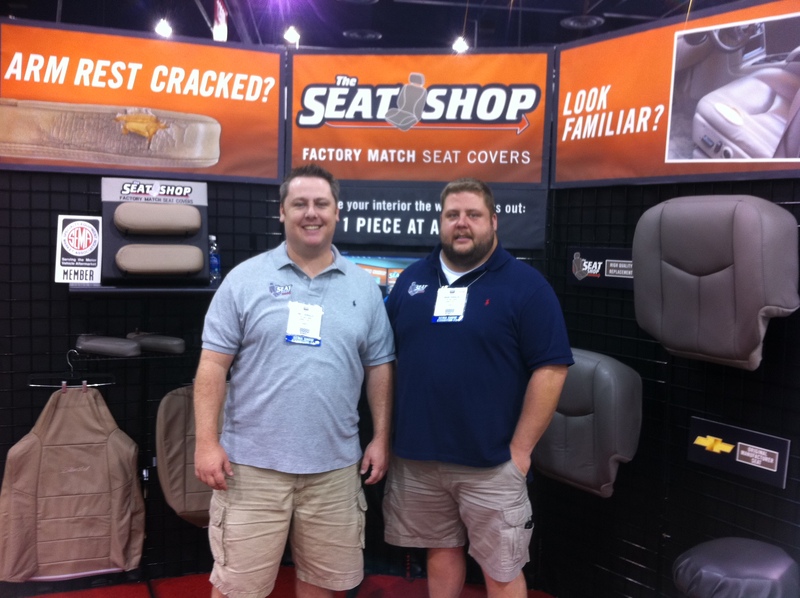 Here’s the Deal…The Seat Shop just got back from exhibiting at the 2011 SEMA show in Las Vegas, NV. It was a great success! We talked to many upholstery shops that are interested in carrying our Factory Match Replacement Leather Seat Covers for Ford and GM full size trucks and SUV’s. Quite a few of these upholstery shops have already set up wholesale accounts and have already purchased some of our covers. They were extremely excited to find a company that carries one-off pieces that match the OEM interiors. This year we exhibited in the Restyling section of the show, and it turned out to be better than SEMA 2010. Last year, we exhibited in the Truck Accessories section, and did not get as much traffic as we were hoping for. The move definitely worked in our advantage. The show went great except for getting one of the owners iPad’s stolen out of the booth on the final day! Here is a picture of Matt and Brian (the owners) in our new, redesigned trade show booth. We are looking forward to what the new year has to bring with the contacts we met!